The Cryo T Shock by Pagani represents a new innovative approach in the treatment of cellulite and undesired fat removal. It uses state-of-the-art thermography and cryotherapy (thermal shock) to reshape the body. This is the first cost effective body contouring solution and won the Most Innovate Device at the Gicare 2014 International Expo in Paris. CRYO T-SHOCK is an innovative medical device which has the cryogenic and thermogenic components that can be used individually or in rapid succession. When applied, in a few minutes it stimulate the natural process of pain reduction and activate the anti-inflammatory processes. The immediate effect of cooling the skin and analgesia lasts for around five minutes, the release of endorphins can have a lasting effect that gives the person a natural high and burst of energy. Where pervious pains and signs of inflammation, as found in blood tests, remain suppressed for weeks to come. 3. A temporary anesthesia of the part subjected to the treatment. Sports injuries are common, especially in high intensity sports like football, basketball, baseball, hockey and soccer. Elite sports injury clinics are amongst the best prepared places to handle these types of injuries, but they are also useful in terms of pain management. Many types of injuries related to sports heal with proper Cryo and Cryo T-Shock treatments. For sports injuries, localised cryo is the only one possible and available treatment to be done.Localised cryo and cryo t-shock are manually applicable without any special restriction to all kind of people since all functions and effects are strictly controlled and observed from the physiotherapist or the physician. This is why, localised cryo and cryo t-shock are widely usable and could be largely effective and relief from pain and inflammation can both be seen and felt immediately. Localised Cryo and Cryo T-Shock therapy has a number of effects on the human body both immediately after injury and later in the rehabilitation process. All you need to know about Cryotherapy and Cryostimulation Cellulite Reduction with CryotherapyAccording to statistics, over 80% of women suffer from cellulite, and until now there hasn’t been much of a solution. Modern technology provides us with the answer – cryotherapy. It has been found that low temperatures have a positive affect on the skin, and overall body condition as a whole. The CRYO T-SHOCK fat-freezing procedure is a non-surgical fat-reduction treatment using controlled cooling and thermo shock to eliminate undesired fat resisting all efforts through diet and exercise. The results are proven, evident. CRYO T-SHOCK is destroying and reducing fat cells in treated areas by about 20% to 40%. The many different functions and processes which take place in the body are caused by chemical reactions occurring between hormones and receptors. These are carried around the body by the blood. The areas of the body which have a lot of fat, tend to have a poor blood supply. This means that the blood borne hormones which trigger lipolysis – the breakdown of fat – are actually unable to reach the fat cells and therefore, the fat can’t be broken down. It also means that mobilized fat can’t get away from the fat cell to be burned elsewhere in the body. 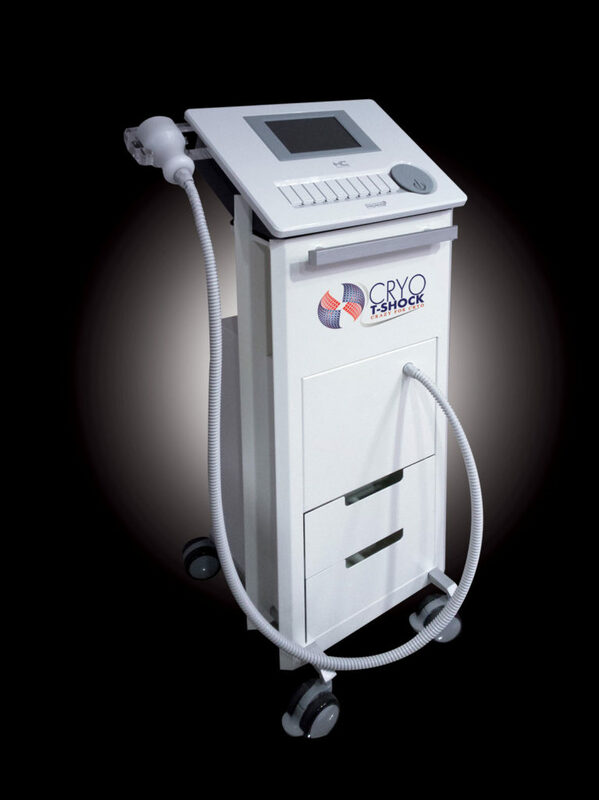 Cryostimulation cools the surface of the skin very rapidly. The body reacts to this extreme cold by turning up its metabolic rate to produce heat. The blood vessels in the area widen, leading to an increase in blood flow, allowing the hormones in the blood to reach the fat cells and break down the fat. This also improves lymphatic drainage in the area, which helps to reduce cellulite. 1. Appearance of wrinkles and fine lines shall be highly reduced. 2. Production of collagen resulting in fuller, more youthful and beautiful rejuvenated skin. 3. Puffiness around the eyes shall be significantly reduced or totally eliminated. 4. Pores on the face and neck shall be reduced in size, limiting the intake of toxins, dirt and grime. 5. Benefits over lymphatic system, flushing away built up toxins, soothe inflammation and irritation, removing puffiness, and redness. 6. Skin conditions like Dermatitis, Eczema, Acne and Psoriasis could be reduced. 7. Metabolic rate increases, Endorphin levels shall be stimulated. What is CRYO T-SHOCK ? Cryo T-Shock is a very affordable, noninvasive and painless process that has no risk of scarring or neuropathy that requires only 10-30 minutes with no need for anesthesia. Other methods of fat removal primarily involve a necrotic cell death by damaging fat with heat, chemical injections or high-intensity focused ultrasound. Each of these approaches pose a potential technical challenge, particularly with respect to targeting the right adipose tissue depth and unintended damage to other structures close or within the fat layer. Cryo T-Shock is a safe non-invasive treatment of adipose tissue to induce lipolysis – the breaking down of fat cells – to reduce body fat without damage to other tissues. It consists of a special developed technique of controlled heat and cold which are applied directly to the patients skin. There are generally no side effects apart from increased urination over several days following the procedure. In some cases, the potential side effects were localized redness that disappeared after a few hours and in rare cases there was local discomfort that did not exceed 2 to 3 hours. There may also be some itching due to the reaction of certain cosmetic products used by clients. To avoid the chances of this it is recommended that you do not use any products before the procedure. There was some experience of delayed onset muscle soreness from treatments on the stomach due to unintentionally engaging the abdominals, which disappeared later that same day. Cryo Slimming may require 3-5 sessions over several weeks and months to see the best results. Cryo Slimming sessions are done once every 2 weeks to allow your body to dispose of cells naturally. Cryo Toning results are more immediate and may require multiple sessions to achieve the best results. The treatment is painless. This is due to the massage technique and the session beginning with skin warming with a gradual decrease in temperature. CoolSculpting will typically cause bruising, tingling, stinging, tenderness, itching and in some instances, the fat congeals leaving the only option to then do liposuction to remove.Cryo T-Shock device uses a 3-phase thermal shock to break up the fat and aid with lymphatic drainage. The skin is only slightly red for an hour or so. Most clients actually find the treatment relaxing. Why choose our Cryo T-Shock treatment ? Difference CRYO TONING AND CRYO LIFT FACIALS ? The dreaded skin sag from aging can be reversed with the T-Shock. The shock of alternating between cold and hot therapies triggers deep layers of collagen back into production. The plumpness and firmness is NOT achievable with other non-invasive techniques.For facials, the T-Shock comes stock with a coupling device for precise treatments to smooth out wrinkles and blemishes to create a tighter skin appearance immediately after treatment. The results are even more profound after 4-8 sessions, with clients reporting more youthful looking skin, as well as a reduction of puffiness around the eyes and smaller pore size appearance. FOR THE BODY - BODY CONTOURING HAS NEVER BEEN EASIER AND MORE AFFORDABLE CRYO SLIMMING ? Most women have cellulite, which, for the most part, cannot be eliminated through diet and exercise. Enter the T-Shock, which reduces fatty deposits by using cold to constrict the good vessels in a localized area. This method is non-invasive and induces lipolysis (the breaking down of fat cells) to reduce body fat without damaging other tissues. The T-Shock works by alternating warm and cold treatments directly applied to the skin.Fat cells (in comparison to other tissue types) are more vulnerable to the effects of cold therapy, which causes what's known as fat cell apoptosis, a natural controlled cell death. This leads to the release of cytokines and other inflammatory mediators that gradually eliminate the affected fat cells. These inflammatory cells digest the affected fat cells and lipids form these fat cells are released by the lymphatic system. The result: a significant reduction of the thickness of the fat layer. HC CRYO T-SHOCK is the most innovative and versatile device for performing CRYO therapy, thermo-therapy and controlled thermo therapy shock. Thermotherapy energy is one of the simplest energy sources to be applied into the physiotherapy field and permits to provoke several benefits, thanks to the physiological effects coming from hot and cold. HC CRYO T-SHOCK, due to its special features and the innovative technology, represents the most interesting therapeutic approach into the physiotherapy field. CRYO-thermia, capable of subtracting heat even in the deepest layers, it’s a completely electronics medical device with a special software, without using gas, compressors, into the full respect of patient’s health and nature. Application time is normally short and it is performed from the operator by using the ergonomic head of the instrument. Gas free, without any compressor, in a small desk-top frame, which could be also placed into a special carrying case for transporting it. The innovative and advanced technology, without gas and any further external substance, make CRYO T-SHOCK a very comfortable device, without any collateral effect. Thermal emission mode is made from the special ergonomic head, without any noise. Effectiveness is coming from the high temperatures and shocks that the unit is capable to reach in a very short therapeutic time, for getting the best therapeutic effects of hot and cold. Into the sports but also into the usual domestic activity at home, it is possible to get a trauma. In order to be effective just after the trauma, for avoiding any collateral effect and complications, it is suggested to reduce pain and oedema, for blocking blood flow. Cryotherapy is actually the sole and most important application needed. Into the chronic and acute phases and pathologies, hot and cold therapy, which is delivered into the deepest tissues, are reducing pain and they could be used also over the inflammation, without any collateral effect. Into the pathologies of joints, articulations, tendons and muscles, warm and cold are the main interested approach for getting therapeutic benefits, both into the acute and into the chronic pathologies. 2. Increased microcirculation at the connective tissue. 6. Effective increase of local circulation determined by the alternation of the biological responses. Anti-inflammatory: it has an anti-inflammatory action because it slows down cellular metabolism which in turn reduces the production and release of chemical inflammatory mediators (histamines, bradykinin, and serotonin)..
Anti-oedema: it is correlated to the anti-inflammatory action and vasoconstriction, which limits extravasation of blood tissues. Analgesic: cold notoriously reduces pain because it inhibits the nerve endings, slowing down nerve conduction of the algogenic impulses and reducing local inflammations. Muscle-relaxant: cold reduces muscle tone and spasms. To obtain these effects, prolonged applications are necessary; whereas, short applications act on the nociceptors which cause reflex muscle contraction. Heat increases tissue elasticity. The effect is particularly evident in the joint capsules, tendons, muscles and in all structures where numerous collagen fibres are present. Heat has the power to accelerate the biochemical reactions of the organism and greatly increases the supply of oxygen to the tissue. This results in an increased metabolism in the treated area. It also has a relaxing effect on patients. Heat therapy can have many applications, but must only be used after acute stages of injury and inflammation subside. The application of heat is very effective on oedema caused by venous and lymphatic stasis. Heat is also suitable to promote and speed up the healing of tissues in case of contusions, sprains, strains and pulled muscles, tendons and ligaments. It is important that the heat treatment is applied only after the initial acute traumatic stage. The application of exogenous heat relieves spasms caused by muscle fatigue because it aids the elimination of lactic acids accumulated in the muscle. Heat can also be used before physiotherapy sessions, massages or stretching to increase muscle oxygenation, skin and muscle elasticity and relaxation.